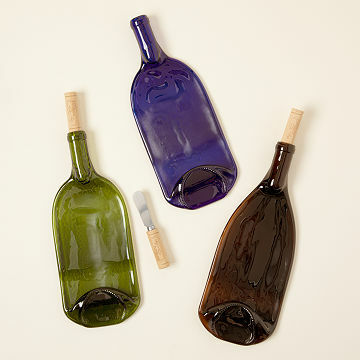 These platters are kiln-formed from recycled bottles and paired with cork-topped spreaders. Rather than see the glass half empty once the spirits are spent, Val Huegerich revives wine bottles so they can join the revelry once more. Her one-of-a-kind glass platters are kiln-formed from recycled bottles gathered from the roadside and national forests near her home in Wyoming. She then cleans and strips the vessels of their labels before melting them into gorgeous, glossy trays. Paired with cork-topped cheese knives, each functional work of art makes a polished backdrop for cheeses and passed hors d'oeuvres. Rustic yet refined, these sets are ideal for the avid entertainer and are great to slip into a picnic basket (along with your favorite cuvée) to make an alfresco lunch a little more special. Handmade in Laramie, Wyoming. Val Huegerich brings out the beauty of items others discard and forget. She considers herself a creator, and when she gets stuck she goes for walks in the national forest that borders her property in Wyoming. Often she finds bottle glass left behind, and it brings her great pleasure to not only create beautiful art from others' refuse, but to also use the process as an opportunity to clean up her surroundings for all to enjoy. Sweet, sweet memories ! ! I haven't used it for anything yet, will serve cheese/crackers or individual candies or just think of happy days when I look at it. Twas a gift, but I have one that I use as a cheese plate but also use as a spoon holder next to my stove. This item came as pictured. It is going to be a gift. I am sure they are going to love it. Very functional and great conversation plate. I bought this for a white elephant gift exchange at my office. I told one of my coworkers about what I got and she stated she wanted to pick my gift, to be fair I wanted to pick my own gift. When it was opened, everyone at the office said how cute it was and what a great gift it was. It was stolen fairly quickly in the game and was really a hit with the party. Great for holiday get togethers or just having a few friends over. Great conversation piece! Just purchased another one for a Christmas gift! My brother and his wife are hard to shop for. As soon as I saw this, I knew it was something they would love. Right now I am displaying it with my recycled bowl. I plan on using it for holidays and dinner parties. It is a fantastic conversation piece. I plan to order more for gifts.